The session was made special by the Home Brew projects shown by Tom. We have often seen his outstanding work but today what we saw was a collection, the like of which could hardly be surpassed. Tom admits he is a builder rather than a designer but tends to play down the exceptional engineering skill he always employs. The multi antenna switch was “best in show” and comprised a dense package of components, coax connectors, switches and wiring. The PCB traces were cut by hand using a Dremmel tool and “Dead-bug” construction was used; Manhattan would a better label to reflect the 3D nature. 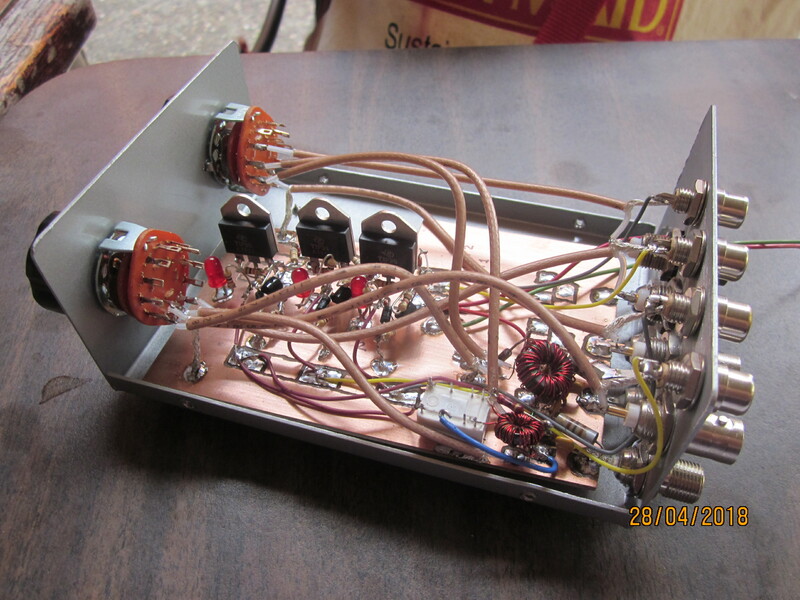 Other projects were a high intercept amplifier, a HF-VHF transverter and a filter designed by Jim Tonne W4ENE (famous for his Elsie filter design software). Tom found it had more pass band loss than expected. Ron questioned the capacitors and will follow up withTom. We had a fairly long discussion on the significance of the term “Low-dropout” as applied to linear DC regulators like the LM317. This is of interest to Ron who needs a very clean dual 12-5 volt supply for his N2PK VNA. This VNA is similar to a dual channel SDRreceiver with a dynamic range in the region of -140 dBc/Hz. Contrast this with the output noise levels delivered by linear regulators in the region of 20 to 40 micro volts RMS. A product made by OM3LZ was designed for this VNA and has exceptional performance and should be the way forward. Ron showed graphs of the series inductive reactance, resistance and Q of a coil used in a 40m Hustler whip antenna. At DC the coil has a resistance of 0.5 Ohms which climbs to 500 Ohms at 10 MHz. Q decreases from about 100 at 50 KHz to less than 10 at 10MHz. We briefly discussed the amount of stray RF leaking through the shield of coax cable. A really good shield might be 98% so this at 1500W is potentially a 30 W noise source to adjacent receivers. It would be fun and quite easy to actually measure the degree of coupling between a pair of RG8, LMR cables etc. The mystery item was a time-honored device about the size of a pencil with a ferrite tip at one end and a brass tip at the other, sorry no prizes. We touched briefly on the subject of maximum power transfer previously raised by Jim K9YC and will defer furthe discussion until the next time he is with us. May 12 is our next regular session but I may have left for the annual visits back East by then. If so I wish you all a joyful and productive summer in whatever of our great hobby appeals to you. I hope you will continue these meetings in my absence and may yourhearts grow fonder.